As I write this piece with the centenary of the Great War approaching, the British media appears to have a new found fascination for the period leading up to 1914. On television we have had ‘Parade’s End’, a drama series based upon the book of his own experiences by Ford Maddox Ford, three series of ‘Downton Abbey’ which, though fictional, has some references to the real lives of rural people on those large Edwardian estates, and a programme about ‘Great European Train Journeys’ looking back to how the well-healed spent their leisure time visiting the great European cities of La Belle Époque. All these programmes paint a picture of affluence, artistic creativity, industrial power, social order and gentility soon to be smashed by the catastrophe of war. However, it was not affluence for all, because those in the work force building the new economic power house had to work extremely hard for a low standard of living with the infant trade union movement only just beginning to exert its influence. It was an orderly society, especially in the rural areas, where the agricultural labour force worked for the aristocratic land owners who on the whole were caring and philanthropic towards their employees and their families. From my family anecdotes, this appeared to be the case in the villages of rural Essex, near to the county town of Chelmsford. One such village was Felsted, where the relatives of my maternal grand mother Winifred Maltby, nee Jarvis, were born. The 1901 census lists a thriving community of the Jarvis family and their cousins, the Livermore family - all living and working around Felsted. was about to be shattered by events caused by rising nationalism in continental Europe, seemingly unconnected to these ordinary British people. This is the story of one of these people, Albert Jarvis son of Robert, who was 22 years of age at the outbreak of war and working as a stable lad in a restaurant in Chelmsford. Together with his cousin Wilfred Livermore, he reacted very quickly to the patriotic call to arms and enlisted on 31st August 1914 at Chelmsford and was then sent to the regimental depot at Warley near to Brentwood. The two cousins were posted to the newly formed 9th (Service) Battalion the Essex Regiment, with regimental numbers 12291 for Albert and 12200 for Wilfred. This was one of the earliest battalions of Kitchener’s New Armies known as K1. According to the Long Long Trail website, after initial training Albert and his fellow recruits were sent to Blenheim barracks at Aldershot in March 1915. Without the army service records, it is extremely difficult to piece together a picture of an individual soldier’s war experiences, so I decided to enlist the services of Chris Baker’s fourteen-eighteen research. This confirmed that Albert was an early enlistee and that he was in the 9th (Service Battalion) Essex regiment which was attached to the 35th Infantry Brigade in the 12th (Eastern) Division - affectionately known as the Ace of Spades Division because that was its Divisional symbol. By February 1915,the four battalions of 35th Brigade had moved to Aldershot where final training for active service was carried out. Orders were received on 24th May 1915 for the 12th Division to move to France. This happened on 30th May, departing from Folkstone to Boulogne on board the ‘Queen’. 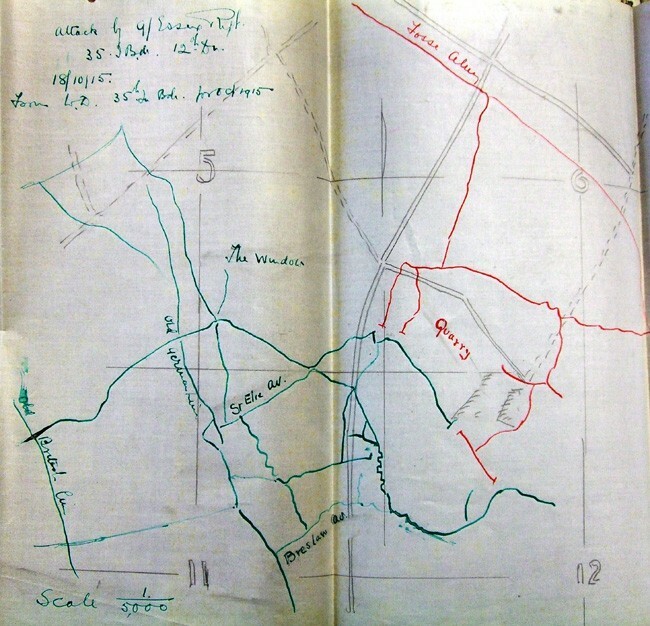 The war diary for 9th Essex WO95/1851 records the events of May and June 1915. 30th May 1st train arrived at Folkestone at 9 45 pm the 2nd arriving 20 minutes later. The whole Battalion embarked on the ‘Queen’ and arrived at Boulogne about 12 midnight where the Bn went to a rest camp for the night about 2 miles outside the town at ORTHERS. The 12th Division moved north and took over a section of front line trenches N E of Armentieres and later around a quiet section of Ploegsteert Wood until in September 1915 things got much hotter, as a big allied offensive, The Big Push, began. 25th September At 5 55am simultaneously with the launching of French and British attacks at various places south of Armentieres, at Hooge and in Champagne a curtain of smoke was raised to conceal our parapet along the whole front. It was preceded at 5 am by an artillery shoot on the enemy lines. The enemy shooting was accurate several direct hits on our trenches causing a score of casualties. This had been a sideshow to the big British offensive further south, which became known as the Battle of Loos. The 9th Essex had been well and truly introduced to mechanized trench warfare that was to be the norm until the last 100 days and the advance to victory in 1918. In the month of September 1915 the 12th Division was moved to reinforce the regular troops engaged in the Battle of Loos. The 9th Essex relieved the Guards Brigades in an area of the Chalk Pit east of Loos-en-Gohelle. Their job was to repair new trenches, roads and positions ready for a renewal of the battle. This was dangerous work with heavy shelling taking its toll including claiming the life of the Divisional Commanding Officer Major General F.D.V. Wing now buried in Noeux les Mines Communal cemetery. LOOS Oct 1 1915 35th and 36th Bgds took over from Guards Division newly dug trenches & the converted German original front and support lines N & NNE of Loos. On 12/13th October 1915, the attack commenced with 37th and 35th brigades of 12th Division attacking the Hulluch Quarries. 35th Brigade led by 7th Norfolk and 7th Suffolk found the protective smoke screen very thin, allowing the enemy to fire both frontally and laterally across their advance. They gained a foothold in the quarries and managed to consolidate their position but were unable to press on. Two companies eventually reached a trench where they remained. Meanwhile the remaining two coys on the left found a portion of the old German trench unoccupied and were ordered by the C O to hold this line. 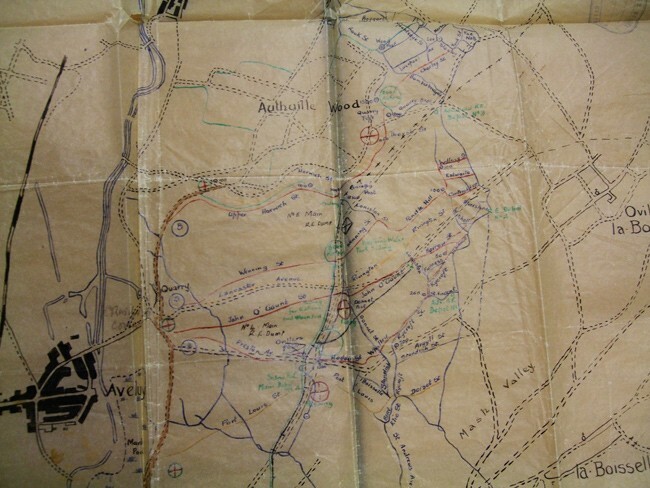 Oct 14th This and the following 3 days were occupied in consolidating the trenches gained. D coy Essex Regt were in position at 5 30 pm. All worked according to orders and a desperate bombing fight ensued. The enemy were driven back all along the trench but not without making a strong resistance. Eventually owing to casualties among officers a barricade was made just short of the objective and the trench was consolidated. Oct 19 4 30 to 8 pm 6 German bombers advanced from the edge of the QUARRY. Only one or two of them reached throwing distance and none returned-------------heavy rifle fire was opened from the edge of the Quarry which was seen to be heavily manned. This was finally silenced by our rifle & MG fire and operations were limited to bombing at the barricade which continued for along time but which we finally gained superiority. Men of 9th Essex Regiment it gives me great pleasure to see you here after your recent action. A counter attack by the enemy was successfully repulsed. I thank you for your good work and hope that you will continue to maintain the tradition of your line battalions which has always been a high one. In 1916 the 12th Division remained in and around the Hulluch Quarries and the Hohenzollern Redoubt trenches, where in March, after the explosion of a significant mine, the 36th Bde was involved in heavy and close hand-to-hand fighting . The Battle of Loos had been a failure and one that the British government could not accept. As with all failures, somebody had to be blamed, and in this instance it was the top dog, Sir John French, Commander of the B.E.F. He was replaced on 19th December 1915 by Sir Douglas Haig who thus became the dominant figure in the history of the British Army for the remainder of the war. The Big Push of 1915 had not produced positive results and the British were being pressurized by the French, who had lost so many men in the first two years of the war, to take on more responsibilities and a bigger part of the western front trenches. Haig had no choice and told his Army Commanders to plan the attack for late June 1916. The die was cast. The British New Army would be pitted against the most formidable fighting machine, the German army. The Germans would be the defenders and they had had plenty of time to prepare their defences. By the spring of 1916 the British Army was composed of its regulars, who had suffered huge losses during the battles of 1914/15, the Territorials and the Kitchener K1 volunteers like Albert Jarvis and his comrades in 9th (Service battalion) Essex regiment. Albert had experienced the realities of trench war since landing in France in May 1915, but there were now thousands of others who, having been rapidly trained in the UK in 1916, were being sent to a quiet section of the front to be chaperoned by a regular battalion to gain practical experience of trench warfare before the front line. In many instances the Pals battalions of this New Army never got adequate training before the Somme. The plan was for the British to use a huge artillery bombardment to soften up the German defences along a 20 mile front, followed by waves of infantry taking the first and second lines of German trenches in one day, thus leading to the breakthrough to be exploited by the cavalry. It was ambitious and greatly exceeded the objectives laid out in General Rawlinson’s original plan - for it was his new Fourth army that was to deliver the attack. So it was, that hundreds of thousands of B.E.F. troops gathered for the biggest military operation the world had ever witnessed and the 12th (Eastern) Division, including Albert Jarvis and 9th Essex, were to be part of it. Lillers June 16th Train No 12 with Bn complete left the station going via St POL -DOLLENS – AMIENS to LONGUEAU where it arrived at 5 45 am 17th. It was timed to arrive about 2 am but owing to heavy battery train and French troop train being unexpectedly parked in the siding in front of us we had to wait outside the station for over 3 hours. Longueau 17th The Bn marched from the station to billets in VIGNACOURT via AMIENS ---FLESSELLES. The march was a trying one after the long time in the train being 14 ½ miles. On arrival in this area the 12th Div joined the 3rd Corps in the 4th Army and is held in GHQ reserves. Strength of the Bn on arrival was 27 officers 918 ORs 37 horses 24 mules 19 vehicles 10 bicycles. The artillery bombardment of the German lines began on 25th June and although it created very uncomfortable conditions for the Germans to endure, they did not have to experience them in open trenches. The majority of them were deep down in their concrete bunkers, free from harm and from all but the heavy high explosive shells of which the British possessed too little. This bombardment went on for a week until on June 30th the battalions of men began to move forward. July 1st 1916, the first day of the Battle of the Somme, is now defined as the blackest day in the history of the British Army. Even the name, Somme, is now used in the English language to define an heroic disaster. The statistics are stark. Almost 60,000 casualties in that one day of whom nearly 20,000 were killed. Masses of young men from the cities and shires of England who had patriotically volunteered to fight for the King and Country at 7.30 am on 1st July 1916 had walked slowly into no man’s land, believing that the barrage had smashed the Germans to pieces and that their task was to mop them up and move onto the next objective. But the Germans were there, deep underground, from whence they rushed to their Machine gun pits and slaughtered the youth of Britain as if it was a fair ground side-show. On that day Albert Jarvis and the 9th Essex were in Divisional reserve. July 1 7 15 am The Bn march to HENINCOURT wood where it remained in reserve until 6 30 pm. 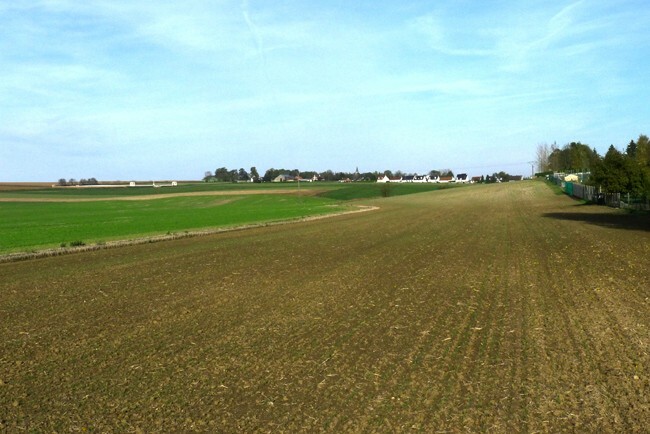 6 30 pm The Bn moved forward into the village of HENINCOURT where a long halt occurred owing to blocking of the road to ALBERT by the other brigades of the 12th Division which were also moving up to relieve the 8th Div which had been severely mauled during the attack in the morning and failed to take OVILLERS. The men of these reserve battalions must have seen what had happened to the attacking battalions on 1st July. They must have known what awaited them as they too were given the task of attacking the heavily fortified Ovillers Redoubt on July 3rd. The artillery bombardment began at 02.15 and after an hour they attacked Ovillers at 03.15. Yet again, the German machine guns emerged from their dug-outs and the fire increased in density as the waves of men advanced. It was in effect - a repeat performance. Very few of the men of the 12th Division battalions that attacked on 3rd July managed to remain unscathed and return to the lines. The Division had 2,400 casualties for very little territorial gains. 2.15am A heavy bombardment of OVILLERS by our artillery was carried out during the afternoon and night preceding the attack. The enemy’s retaliation became heavy about 3 am especially on front and supporting lines. 3.7 The leading waves of the Berks & Suffolks left our lines. 3.20 The 1st lines of the Bn followed in pursuit. The Berks & Suffolks went right over the enemy’s front & support lines and some troops entered the village together with the leading lines of the Bn which had come up in support. The Bn suffered severely during the advance across the open from M G fire from either flank and from the village. The troops were unable to hold their ground and were driven out by bombing and M G suffering very heavily in getting back. The last line of the Bn.was checked in front of the strong point on a terrace overlooking the German front line across the road leading into the village from a S W direction i.e. AVELUY--- OVILLERS road. The attack on OVILLERS came to a stand still about 4 30 pm. and the remainder of the 3 Bns withdrew inside our lines. The experiences of the wounded on the first days of the Somme are well documented. For many it meant lying out in no man’s land hoping that someone would find them. In one instance, there was even a brief local truce so that both sides could collect the wounded. The medical services were severely over-stretched by the numbers and thus many died of wounds which could and should have been easily treated. Albert Jarvis was therefore lucky. With no army medical record available we can only surmise that he went through the chain of medical treatment which might have begun with the R A P - Regimental Aid Post which provided basic first aid before being passed down the line to the A D S - Advanced Dressing Station, where wounds would have been dressed and emergency operations untaken. It was the ADS s that were totally overwhelmed during the big battles like the Somme. 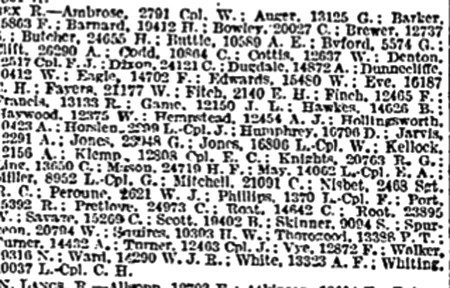 From the ADS he was probably transferred to a C C S - Casualty Clearing Station which held up to a thousand casualties. These Clearing Stations were located near to rail depots and many of them are marked today by military cemeteries. 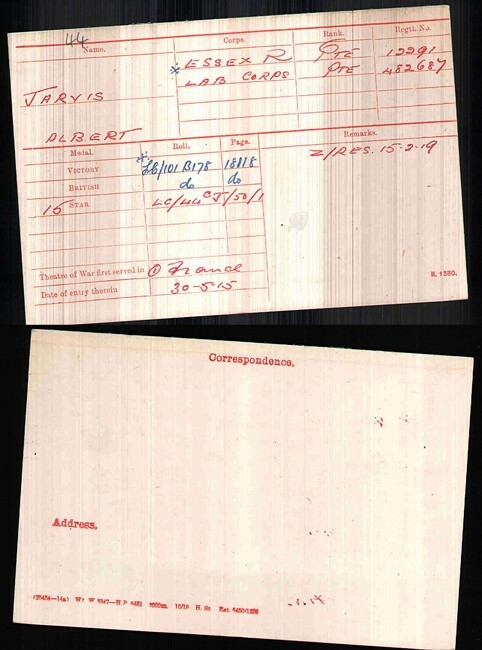 As his Medal Index card shows, Albert also served in the Labour Corps Pte 482667. 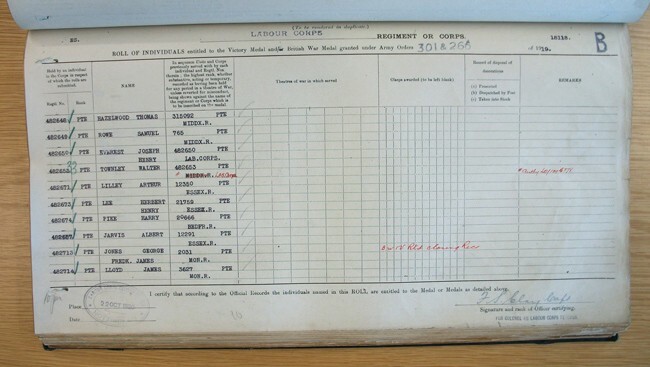 Prior to the formation of the Labour Corps in January 1917, the wide range of manual support jobs were undertaken by the Infantry and Pioneer battalions of the various Divisions. From January 1917 these jobs, notably the mending of roads, were undertaken by the Labour Corps - composed of men who were medically rated below A1 condition and thus not fit for front line infantry duty. By the end of the war, 10% of the Army was in the Labour Corps and many of them were returned wounded like Albert Jarvis. Few records exist of the Labour Corps units and thus I sought the assistance of Chris Baker’s foughteeneighteen research. From this, it appears that Albert and others were posted to the 32nd Bn Middlesex Regiment based at Gorleston, Norfolk. This had been formed on 1st January 1917 and was made up of men who were rated fit enough for home service. On 24th November 1917 about 100 men from 32nd Middlesex were transferred to the Labour Corps and posted to 660 Agricultural Company with its HQ in Norwich. These Agricultural Companies had been formed by the Army Council in June 1917, after which men from the home-based units were drafted in to assist with the 1917 harvest and to provide labour detachments for farm work for the remainder of the war. With no further details again we can only suppose that Albert Jarvis from rural Essex remained working on Norfolk farms for the remainder of the war. Whatever his wound it had been serious enough to prevent his being sent back to the front, unlike his brother Frank who tragically was killed in 1918. For Albert it must have been a return to a rural farm life that he had known from child hood and a chance to make an important contribution to the war effort at home. No doubt he had leave and a chance to return home to Felsted on a regular basis until on 15th February 1919 he was transferred to Class Z Army Reserve enabling him to return to civilian life. As he had been wounded it is likely that he received some form of pension even though he had not been discharged from the Army on medical grounds. What he did, I do not know, as I have no family documents to tell me if he remained in Norfolk or returned to Essex or whether he married, had a family or when he died. He, like the remainder of his family, must have been shocked when in November 1918 they received news of the death of Frank Jarvis his brother, who is remembered on the Felsted village war memorial together with Wilfred Livermore the cousin who had joined up with Albert in August 1914. Regrettably Albert’s name does not appear on Felsted’s Roll of Honour that lists all those men who had answered Kitchener’s call to arms in 1914 because at the time of his enlistment he was living in Chelmsford. 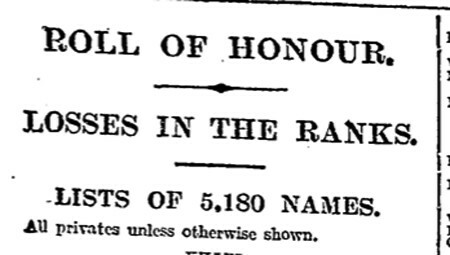 However, fittingly, there is now a Felsted and Little Dunmow Roll of Honour Project which lists all those local people who fought and in many cases died during the Great War amongst whom is listed Albert Jarvis of Pond Gate Farm. Ian Hook curator Essex Regiment Museum Chelmsford.